Last year BenQ shook up the wide gamut monitor world with the release of the BenQ SW2700PT 27” Adobe RGB monitor (Reviewed here on my Blog and also on the Luminous Landscape website). This 27” monitor offers excellent performance for a wide gamut Adobe RGB display at a price point that was (and still is) far lower than the majority of competitor offerings. When I reviewed the SW2700PT last year, I wrote that it offered exceptional performance at its price point. Having now lived with this monitor in my studio for the better part of a year I can say without a doubt that this is still the case. If you are in the market for a wide gamut monitor with accurate color and excellent uniformity on a tight budget I doubt you could do any better; or could you? In November last year at Photo Plus in New York BenQ showed us a sneak preview of it’s recently announced (but not yet available for sale) 32” SW320 4K UHD Wide Gamut Monitor. As of publication time of this review the SW320 has not yet been officially released to the public for sale, but I have been testing a production sample of this monitor in my studio for the last few weeks and have now had the time to write a complete review of this remarkable new display. To be clear, the SW320 is not designed to replace the previously reviewed SW2700PT, but rather to supplement the BenQ line up with a high-quality 4K UHD wide gamut offering at a competitive price point. So has BenQ succeeded? In a nutshell; Yes, they have. The SW320 builds upon the success of its exceptional smaller brother (the BenQ SW2700PT) while unequivocally setting a new performance benchmark for wide gamut monitors at a low price point. In addition to its UHD resolution, the SW320 takes image quality to the next level with the addition of HDR capabilities (not found in the much more expensive Eizo CG-318 I also reviewed last year). 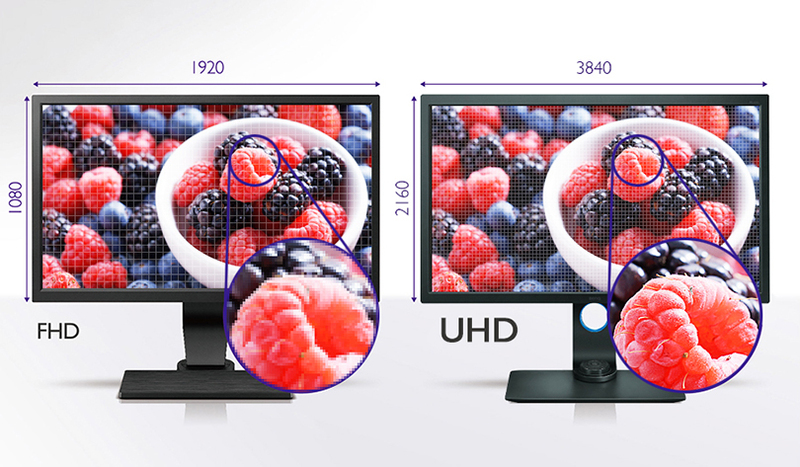 According to the supplied literature from BenQ, High Dynamic Range (HDR) increases the overall dynamic range between black and white, so the resulting image appears closer to what your eyes see in the natural world*. *To view HDR content from your device, ensure that you use the HDMI cable provided with the SW320 monitor or a High-Speed HDMI Cable or Premium High-Speed HDMI Certified Cable. Does this HDR feature make a difference in the real world? Its hard to say in my experience to date without rigorous scientific testing (which I have not had time to do); but in my user experience thus far I have no hesitation in stating that the SW320 has outstanding contrast and dynamic range. In short, the new 31.5” 4K UHD monitor offers extraordinary performance with a true 10-bit panel with 99% Adobe RGB, 99% DCI-P3 and (Eizo claims 98% DCI-P3 for their CG-318 4K Display) 100% sRGB color space coverage as well as supporting HDR content. The knock out punch is that it does so at a price point previously unheard of for a monitor of this size with these features. That isn’t the whole story though as the new BenQ SW320 has other improvements over and above monitor size, resolution and image quality. 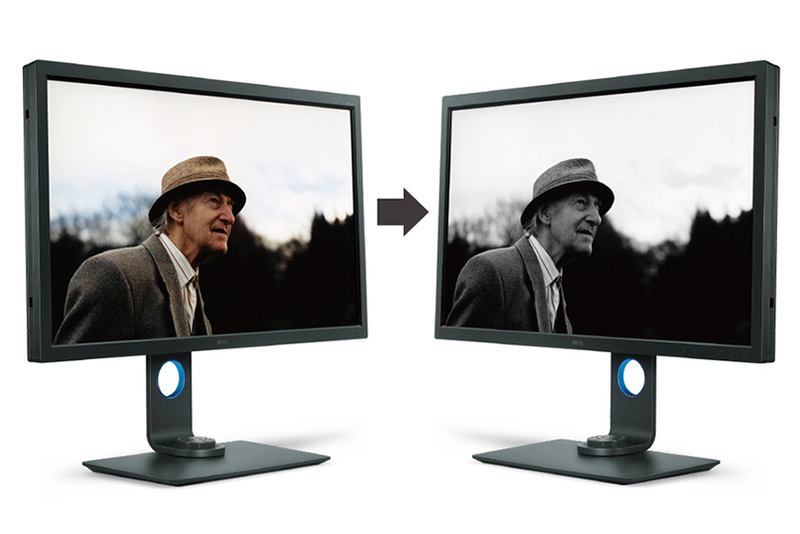 The overall quality of color reproduction on screen has been further improved from the SW2700PT. In side by side comparisons, the SW320 outperforms its smaller brother in color fidelity and uniformity. Lets examine the features and performance in more detail as well as compare this new screen to other UHD and 4K Displays on offer in the marketplace. 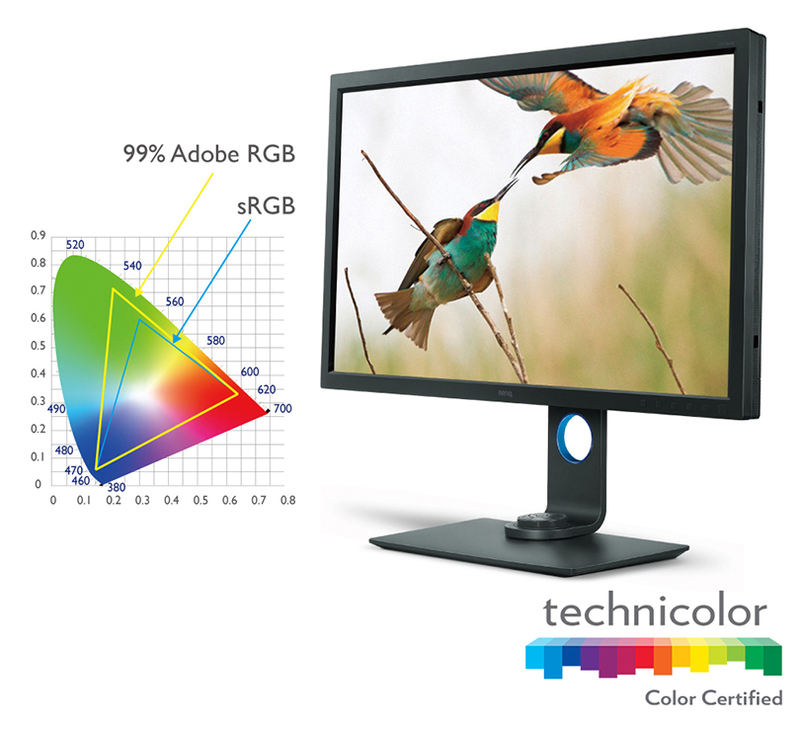 * Technicolor® Color Certified is a designation reserved for devices — PC monitors, laptops, all-in-ones, and tablets — that satisfy the required Technicolor specifications during the device’s manufacturing process to meet the same strict standards for color accuracy used in Hollywood and throughout the media and entertainment industries. All Technicolor Colour Certified devices display colors accurately, consistently and exactly as the content originators intended. Anyone can enjoy shopping, entertainment, and gaming experiences with full confidence that the color you see on screen is accurate. There is no need to regurgitate a complete list of the SW320 specifications as those are already available on BenQ’s website. 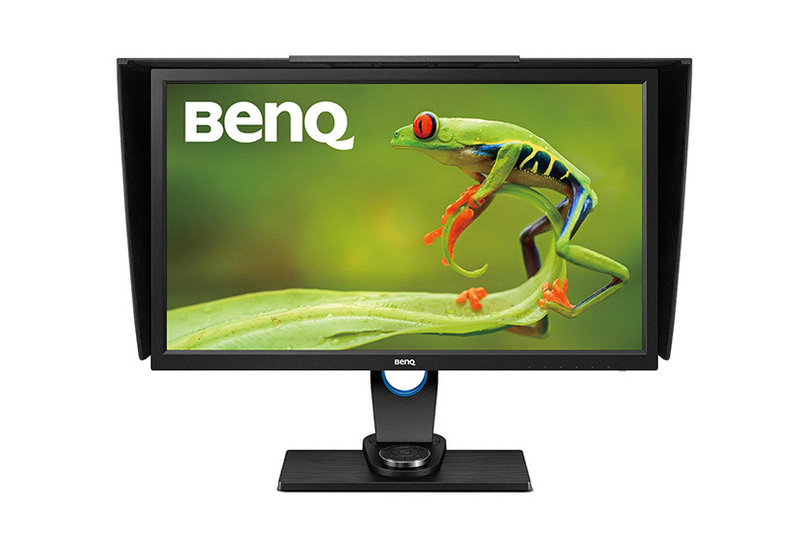 See the SW320 page on BenQ’s website for full details. Out of the box the BenQ SW320 is a breeze to set up, and in less than ten minutes I had the stand fully assembled, the display plugged in (via HDMI) to my MacBook Pro and the system fully operable. It seems to me that with every new model BenQ has continued to refine and improve their display stand and ease of installation. Other manufacturers would do well to take note. Like many displays, the SW320 ships in ‘flame-thrower’ mode and out of the box was far too bright for my viewing environment. I know manufacturers do this to try and impress viewers who will no doubt see the display first in a brightly lit fluorescent showroom but I really wish they wouldn’t. Once calibrated however to a more reasonable 120 Candelas and D6500 Kelvin I was able to properly assess the SW320’s performance and make direct comparisons against other displays. To get the very best results from the SW320, the profiling software you use needs to access the internal monitor hardware Look up Tables (LUT), and for that, you need the supplied Palette Master Element software. For Apple users, the supplied software is installed as an application. I don’t own a Windows machine so did not test the software under a Windows environment. 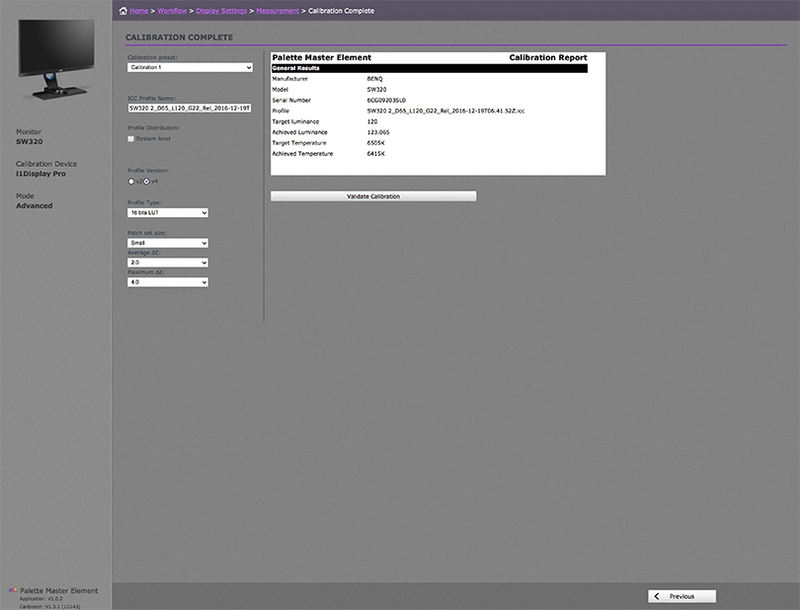 The SW320 ships with the BenQ Palette Master Software; but it can also be downloaded for free from the BenQ website. 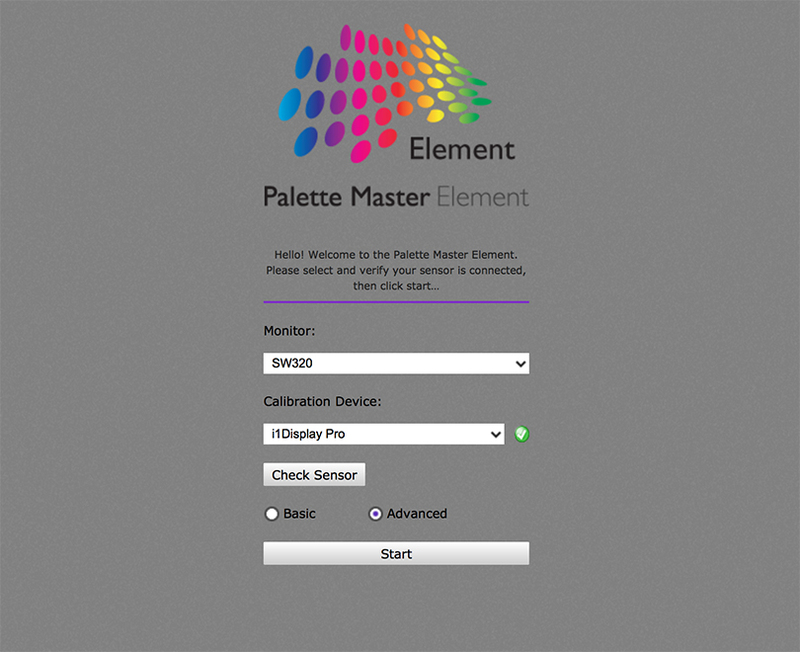 By using the Palette Master Element software and a calibrator (X-rite i1 Display in my case), you can tune and maintain the color performance of the monitor at its most optimal state. 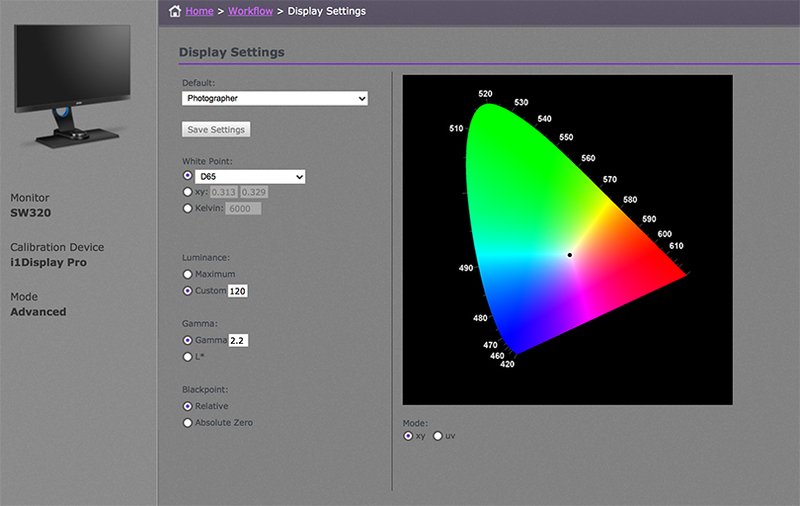 The BenQ SW320 currently supports the X-Rite i1 Display Pro / i1 Pro /i1 Pro 2, and Datacolor Spyder 4/5 colorimeters. I tested all of these during my time with the SW320 and all performed without issue. BenQ provides a user-friendly instruction manual with the Palette Master Software that you can download from their website. There is both a basic and advanced mode to choose from. The instructions are clear, concise and easy to follow. Download the PDF Manual HERE. Before you rush out and purchase any UHD or DCI 4K display you should make sure your computer can drive the display at its native resolution. In my case, I tested the SW320 with both a 2013 6-core Mac Pro with 64 gigabytes of RAM and dual AMD FirePro 500 video cards and a late 2013 15” MacBook Pro with a NVIDIA GeForce GT 750M 2048 MBMB and both were able to drive the display at its full native resolution. I did notice the fan kick in more often on the MacBook Pro when driving the SW320 than with the previous SW2700. This is to be expected as the video card is being driven much harder with the higher resolution display. There were, however, no ill side effects, and system performance and speed appear unaffected in general day-to-day use. The BenQ SW320 also includes an Advanced Black and White mode that allows you to view your photos in a black and white film effect. You can choose from three different black and white presets to preview your photographs in before you perform actual adjustments in Lightroom or other image editing applications. I am not a black and white photographer, so I didn’t test this feature other than to quickly check it functions as advertised; which it does. Black and White photographers should test this feature to see if it fits within their workflow. The BenQ SW320 is equipped with a very cool new feature called GamutDuo. GamutDuo enables you to view content simultaneously on the screen in different color spaces side-by-side for easy comparison. I found this new feature quite useful to soft proof images going from Adobe RGB color space to SRGB for the web. By viewing the two images side by side, it is very easy to see the differences. Users who have to re-purpose their photographs for different color spaces are likely to find this a very useful feature. To activate the GamutDuo feature, you switch to PIP/PBP mode. 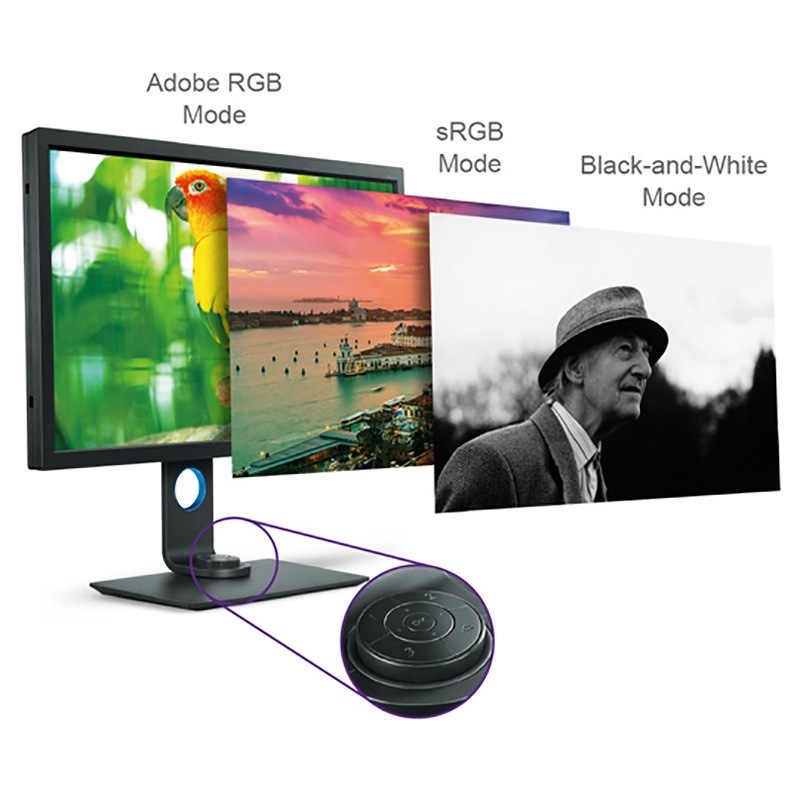 Like the BenQSW2700, the BenQ SW320 ships with a The Hotkey Puck that allows the user to switch between Adobe RGB mode, sRGB mode, and Black & White modes effortlessly. The hotkey buttons can also be customized to map other modes or OSD settings, such as brightness and contrast to bring added convenience to photographers. The Hotkey Puck is a nice addition, and it is worth taking a bit of time to properly understand its uses and how it might save you time in your workflow. Comparisons between the BenQ SW320 and the previously reviewed Eizo CG-318 4k DCI display are going to be inevitable, so lets get those out of the way (since I have both displays side by side in my studio). Firstly, and perhaps most importantly there is a huge price differential between these two monitors. The Eizo retails for approximately $6000 USD MSRP, and the BenQ will likely sell for under $1,500 USD when it goes on sale shortly. That difference alone is going to make a choice a no-brainer for most people. There are however some other important differences worth noting. Whether those differences are worth the $4,500+ USD hit to your hip pocket depends on your needs and circumstances. Firstly the Eizo CG-318 is a true DCI 4K Display with a resolution of 4096 x 2160. The BenQ SW320 is UHD (Ultra-high Definition) with a resolution of 3840 x 2160. The DCI 4K standard goes above the UHD resolution of 3840 x 2160 pixels that is often confusingly marketed as being 4K instead of UHD. Perhaps the easiest way of defining the difference between 4K and UHD is: 4K is a professional production and cinema standard, while UHD is a consumer display and broadcast standard. While the difference on paper between 4096 pixels (DCI 4K) and 3840 pixels (UHD) on the horizontal access is only 256 pixels this equates to a not inconsiderable 7% increase in resolution across the entire display that makes for an overall larger workspace. However, unless you have specific need of a DCI 4K Display in your workflow, there is frankly little benefit to the additional resolution in real world applications in my experience. In fact, you may prefer UHD resolution for pixel mapping if you are dealing with 4K consumer video. The Eizo CG-318 also has its own built-in calibration device that can be automated and scheduled. The BenQ requires the use of an external colorimeter (like most displays including the NEC Spectraview range). This isn’t a big deal in daily use, although one could argue its awfully convenient to simply schedule the Eizo to calibrate itself once a week. The BenQ SW320 does include thoughtful nag warnings to remind you to calibrate the display on a regular basis. How often you choose to calibrate depends on your circumstances and how neurotic you want to be with your hardware. In general, I find every few weeks to be more than sufficient. Measuring color gamut between the Eizo and the BenQ SW320 is a pointless exercise since for all intent and purpose they are identical in real world applications. Both produce 100% of the SRGB color space, and both produce 99% of the Adobe RGB space. Any subtle differences in gamut are a quibble. Regarding brightness uniformity the SW320’s exceptional uniformity is achieved through a delicate process involving the utilization of high precision apparatus to meticulously fine-tune hundreds of sub-regions on the entire screen. The results of this fine tuning is a noticeable and significant improvement in uniformity over the SW270, and outside of the extreme corners, it measures almost as good as the Eizo CG-318. This is remarkable performance, regardless of price and BenQ is to be commended for their efforts in obtaining this exceptional level of uniformity. 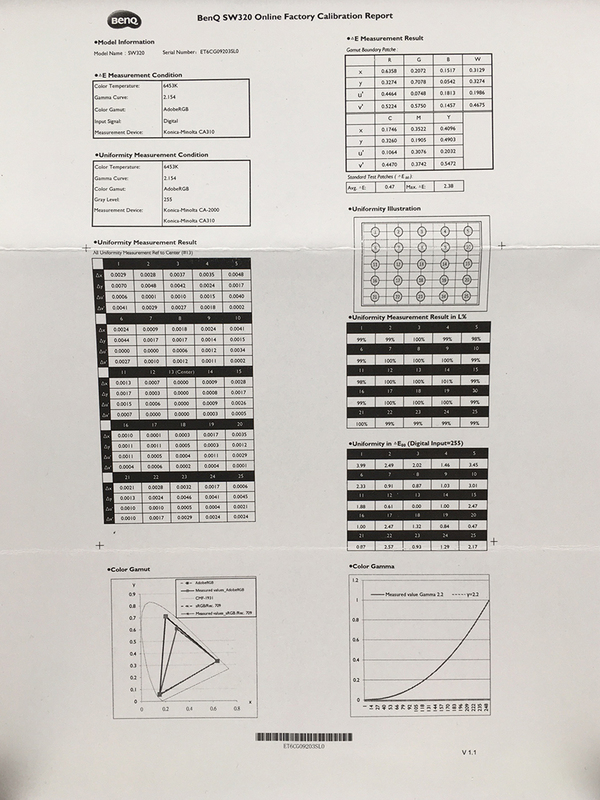 You can check how your individual BenQ SW320 monitor performed in its uniformity test on the supplied Factory Calibration Report. Comparing a sub $1,500 USD MRSRP display to one that costs around $6000 USD MSRP might seem a bit unfair, but the results illustrate just how good the SW320 is and just how much bang it offers for the buck. Quite honestly, its ground breaking performance at this price point. Perhaps a fairer comparison would be to compare the NEC Sepctraview UHD display against the new BenQ SW320, but unfortunately, I did not have access to this display for a direct comparison. Since the NEC Spectraview sits between the Eizo and the BenQ regarding price it will no doubt perform equally well and I suspect any differences outside of calibration software in real world use to be a quibble. Comparing the BenQ SW320 UHD display to LG’s 27” Ultrafine 5K display (as sold by Apple) is somewhat of a mute argument since LG do not quote how much of the Adobe RGB gamut their display is capable of producing; other than to say it produces ‘P3 wide color – 99%’. Nor are there any uniformity tests available for the 5K LG display that I could find (I did not have a display available to test uniformity for comparison with the BenQ SW320 at the time of this review) and none of the online reviews I could find on this display even mention uniformity in passing. One other key point of difference is the LG has a high gloss screen, and such screens are far from ideal for making fine art prints in my experience. I suspect anyone interested in a wide gamut display for making prints will dismiss the LG out of hand just because of its gloss finish. 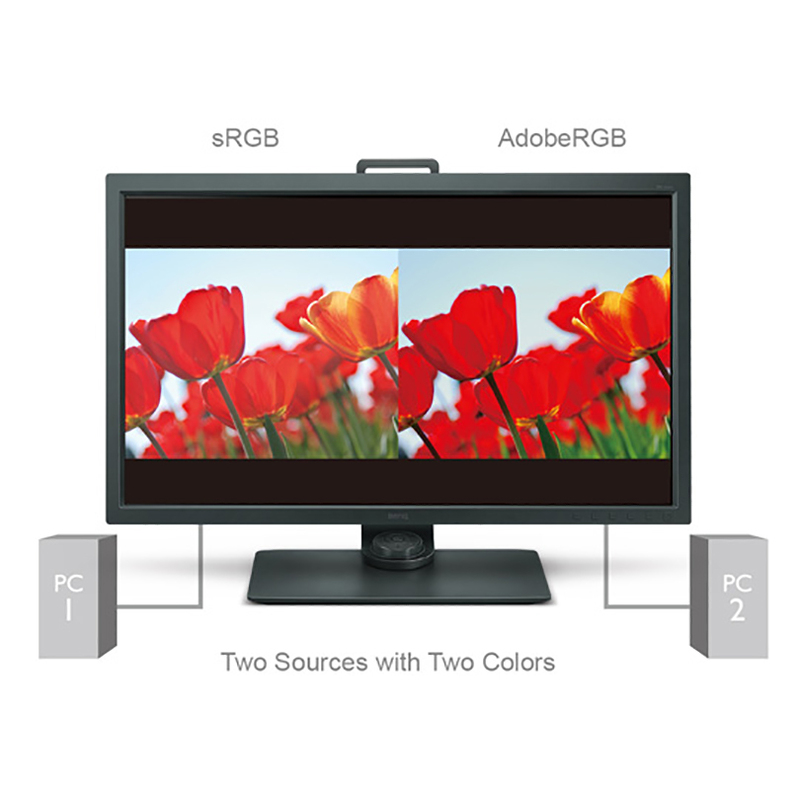 Screen surface aside, purchasers of wide gamut monitors should be aware of the differences between the DCI-P3 and Adobe RGB98 Colour Spaces. While the overall volume of the two spaces is similar, the red and green primaries are shifted in DCI-P3, and as a result, there are not insignificant differences between the two color spaces. Technically, the DCI-P3 space isn’t new. It was established in 2007 by Hollywood as a standard for digital projection devices. This Colour Space was designed to best mimic the color range of motion picture film, as projected. Since still photographers don’t digitally project in theaters, we’ve been more or less ignoring DCI-P3. Here’s the problem, though. The old video standard, Rec.709 was for all intents and purposes essentially identical to sRGB. Videographers and still photographers were getting the same thing. DCI-P3 is about the same size as AdobeRGB; only it’s skewed differently in the CIE color model. AdobeRGB extends deeper into the greens and blues, while DCI-P3 extends more into the reds and a different set of greens. For still photographers, that means we’ve now got a mismatch we need to look out for. This mismatch is going to be most troublesome for people who shoot JPEGs in AdobeRGB Color Space or for photographers outputting RAW files into the Adobe RGB color space for print applications. AdobeRGB has colors in it that DCI-P3 can’t display and vice versa. Videographers beware that for true digital cinema work, just having a P3 color space isn’t sufficient. The Digital Cinema Initiative (DCI) standard also specifies a gamma of 2.6 and a luminance of 48 cd/m2 or 100 cd/m2 depending on whether you’re targeting movie theaters or television, and there are also various white point standards. You will still have to use a profiling device to make sure the display is hitting the correct gamma, luminance, and white point numbers for the specific standard you’re targeting. And of course, the LG5K Display does not offer the much more powerful Hardware LUT capability of the other Wide gamut displays discussed above. 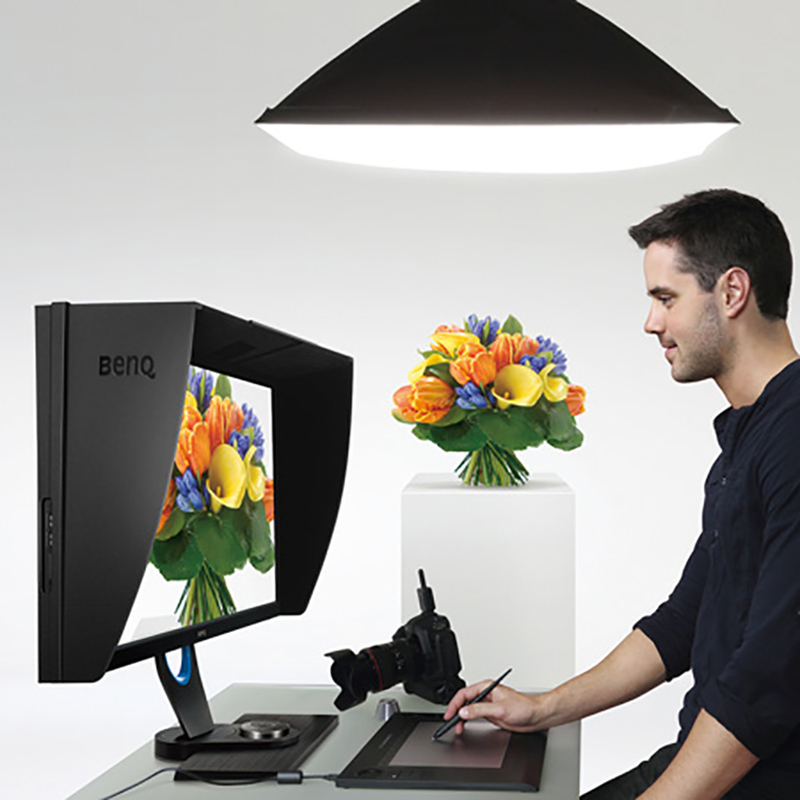 Knowing that ambient lighting can obstruct color accuracy, all BenQ SW series photographic monitors include a detachable shading hood to reduce screen glare to deliver the most accurate colors possible. The newly-designed shade hood included with the SW320 can be used in portrait orientation as well as in landscape orientation (a very nice design consideration). What I appreciated is the solid build quality of the shade hood. It feels like a high-quality addition to the display and not a cheap plastic after thought; like it does on the much more expensive Eizo CG-318 display. In fact, the Eizo CG-318 shade hood looks positively cheap and nasty in side by side comparisons. Once secured in place the shade hood feels extremely robust and is nicely finished inside with anti-reflective black flocking. BenQ is to be commended for providing a shade hood with the display of such a high quality. Another nice touch is the addition of a small operable window at the top of the shade hood to pass a colorimeter through for screen calibration. Quite honestly, the shade hood included with the SW320 is the best I have seen regardless of the brand or price of the monitor. Attention to small details is very important in high-end displays, and I was very pleased to see that the bezel of the SW320 is finished in a dark gray matt that minimizes any potential bezel reflection. I am told from the factory that extensive testing was done on various bezel surfaces to achieve the best result and most optimal viewing experience for photographic professionals. This sort of attention to detail might sound trivial, but it ensures an optimal result when you are working for hours at a time in front of the display. In addition to coating changes, the monitor’s stand has been redesigned in a minimalist style, with a sleek L-shaped neck that streamlines with the monitor frame. It looks great on my desk and will likely fit well in most studio spaces. The stand is shipped in two pieces and is easily assembled without tools. There is some facility for cable management, and over all the stand feels very solid and well made. In Real world use the first thing you notice on turning on the SW320 is the incredible resolution that a UHD screen provides and the subsequent desktop real estate that this resolution enables. If you are used to working with a lower resolution, display the vast real estate that this sort of display offers will be a revelation to you. Depending on how close you sit to the screen and the quality of your vision you may need to implement some scaling to increase the text size. In my studio, I sit quite close to the monitor and have (as of last test 20/20 vision) no problem reading text on the screen without the need for any software scaling. Daily life in a UHD environment under MAC OS X just works provided you have good enough eye sight to read the small text. If (like me) you like to work on a single monitor then you recognize the high value of having significant desktop real estate; something the SW320 provides in spades. Colour rendition is excellent on the SW320, and the UHD resolution makes for a powerful and versatile work space. My daily use for a monitor such as the SW320 involves the editing, post production, and printing of digital files in Adobe Lightroom and Adobe Photoshop Creative Cloud. I also use applications such as in-Design, Premiere Pro and other image-related programs and plug-ins. On the whole, most of my time is in the majority spent in Lightroom and Photoshop and thus this is the area that my comments are most related. Working in Adobe Lightroom on the BenQ SW320 is a joy and pleasure. It has always bothered me that the side panels in Lightroom are fixed and not tear away (yes, they can be hidden, but I prefer to tear off). The SW320 has so much screen real estate and resolution to play with that the fixed panels are now an absolute non-issue for me. I used to have to hide the panels to gain resolution for the actual image on the horizontal axis for a standard 35mm ratio image. On the SW320 however, the extra screen real estate provides sufficient resolution to negate this need and the side panels can now be left open all the time. This might seem like a very small benefit, but in real-world use, it’s extremely beneficial to my workflow. Again, your mileage may vary. Contrary to what I have read on the internet in various places I experienced absolutely no issues with Lightroom or Photoshop running slowly with a UHD display. I suspect any such issues are almost certainly related to video cards being driven to their limit (and beyond) or because users are not implementing the latest software versions. The color rendition of the SW320 is exceptional and when combined with the excellent uniformity the display offers it is extremely easy to judge tone and contrast when processing RAW files. For those of you who place a large emphasis on printing (as I do), you will find the BenQ SW320 to offer very good performance. In fact, it offers performance that far exceeds its modest price tag. The BenQ SW320 is a superbly constructed high-quality UHD wide gamut monitor that offers users exceptional resolution, color accuracy and uniformity at a price point previously unheard of. The monitor is simple and easy to assemble and operated without issue out of the box with both my laptop and main desktop computers. Overall picture quality is exceptional with excellent linearity and uniformity across the screen that matches the much more expensive Eizo CG-318 in all but the extreme corners. This is an outstanding performance that photographers and other graphic artists will appreciate in daily use. The SW320 is also packed with useful new features including GamutDuo and an Advanced Black and White mode that photographers are sure to find beneficial in their workflows. When I reviewed the Eizo-CG318 Display I niggled that the HDMI ports really should have been version 2.0 and not 1.4 on display at this price point. I was extremely pleased to see that the BenQ SW320 includes V2 HDMI (again at a price point well below the Eizo). Regarding connectivity, it is also worth noting the thoughtful addition a USB hub with 3 USB 3 ports; one port dedicated to the HotKey Puck. A few other nice additions worth noting include VESA mount compatibility and an inbuilt card reader (I prefer external readers but this addition will no doubt prove useful to some). The OSD menus can also be configured in a whopping seventeen different languages. I am primarily a stills photographer who only occasionally works in video so I confined my testing to predominantly sill images. The video I did pass through the SW320 looked extremely good to my eyes and videographers should be extremely happy with the performance of this display. During the review, I tested several 4K video pieces as well as upscaled 1080p video content. The BenQ SW320 monitor offers the big and accurate color space I need in my photography and the power of the hardware LUT means there is no banding or posterization in any of the test images I tried when reviewing the screen. I tested the SW320 with a wide range of my photographs as well as a large suite of ISF (Image Science Foundation) test images designed specifically to trip up displays (ISF test images are designed to show up weaknesses in displays not often found in general viewing). The SW320 performed without issue on all counts. 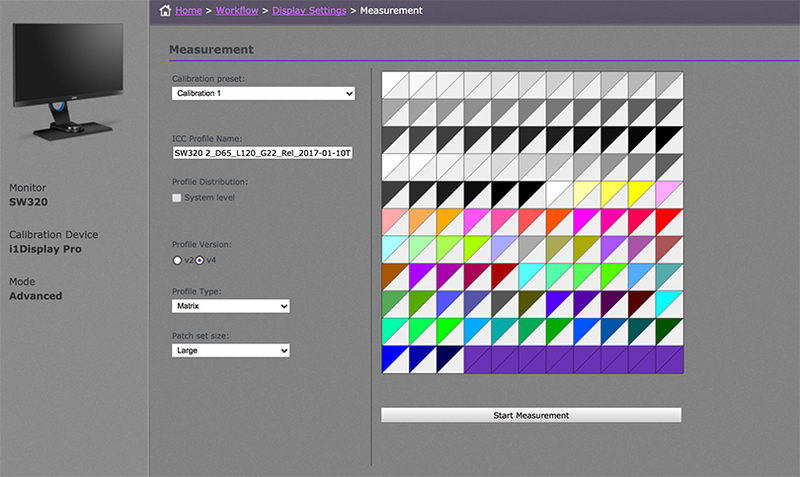 I feel it is extremely important that calibration software is intuitive and easy to use. In fact, the simpler, the better in most cases as it means there is less chance of users making a mistake during the calibration process. To BenQ’s credit, the supplied Palette Master software is easy and intuitive as well as ensuring accurate calibration of the display. If you purchase an SW320 be sure to use the Palette Master Software to ensure you are accessing the Hardware LUT for the best possible results. Overall the BenQ SW320 is a superb display that offers a huge UHD resolution workspace in combination with a wide gamut Adobe RGB display at a price point that puts the competition to shame. 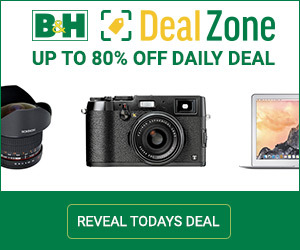 That is quite a combination that I feel will again see BenQ shake up the marketplace as photographers rush to embrace a display that offers performance and a feature set previously found only in much more expensive displays for those with much deeper pockets. In the spirit of full disclosure, I would like to be clear that BenQ provided me with the SW320 test unit at no cost (at least I have received no invoice to date). I also want to be clear that although I am officially an ambassador for BenQ they have in no way tried to influence my review and instead specifically asked me to be thorough and rigorous in my testing of the SW320. I only ever accept products to review on the clear understanding that I will be completely impartial and report anything negative I find as well as anything positive. Since I am using these products in my workflow being clear, honest and forthright is my number one priority.